Traditionally, Ashram members and guests meet mornings and evenings to meditate together in silence and participate in spiritual studies and practices. This has been an integral part of Ashram life, designed to provide inner nourishment and renewal as well as a continuing spiritual education. It is to help each person discover the state of natural harmony, unity and clarity through yogic meditation and Self-awareness. All are encouraged to participate. 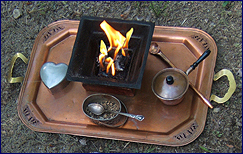 Programs usually begin with a simple form of the ancient Vedic fire ceremony, offered for world peace and holistic healing, both personal and planetary. The fire ceremony includes chanting of Sanskrit mantras and is followed by a period of silent meditation. This is an opportunity for all to meditate, silently pray or simply relax, according to their individual background and preference. An essential part of the Ashram programs is the presentation and discussion of the philosophy of Yoga and Vedanta, using writings and recordings by Shri Brahmananda Sarasvati and other spiritual teachers. In addition, there may be selected readings from a variety of sources, including works of realized men and women from different global traditions who emphasize the harmony and unity of all existence. A special feature at Ananda Ashram is the direct approach to the ancient teachings through the chanting and in-depth study of the original Sanskrit texts. Emphasis is on the important scriptures that form the foundation of the philosophy of Yoga and Vedanta. Devotional music and singing (Kirtan) often conclude evening programs. On weekends and different occasions throughout the year, cultural performances or lectures by guest teachers are also offered. The Ashram daily programs are facilitated by teachers who studied directly with Shri Brahmananda Sarasvati over a period of years. 9:45-10:30/10:45am Scriptural Studies, readings or recordings. Includes chanting, translation and discussion of Bhagavad Gītā, Upanishads, Shankaracharya's Ātma Bodha, and other texts of Yoga-Vedānta philosophy. With reading of commentary by Shri Brahmananda Sarasvati where available. With Bharati Devi and Karuna Devi. 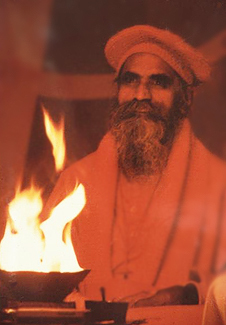 Fri, Sat, Sun: 7:00pm / Mon-Thu: 7:30pm Meditation and Fire Ceremony followed by group chanting and/or readings from Shri Brahmananda's essays and various spiritual sources, study of Yoga Sūtras or recordings of Shri Brahmananda's satsangs. With Joan Suval (one Saturday/month exc. Jan & Feb), Bharati Devi, Tara Devi & others. 8:00pm on weekends: Kirtan, special cultural events or lectures when scheduled. Suggested Donation for attendance of a morning or evening program: $10 / members $5. Admission to cultural events: $20 / members $15. Included in Ashram overnight guest rates.